The talented Carissa, from Mom Tv’s Multiple Moments, will be teaching you how to make a cuddly baby blankie! This will make a great gift… so don’t miss out! Join her live at Saturday at 11am est on Mom Tv! Join us every Saturday at 11am EST for Sew Krazy on MomTV! This week, we’ll be making fleece ponchos! This sew easy pattern will be a fun project for those upcoming Winter days! The project is suitable for both a boy and a girl. You never know what might happen on this LIVE show… so tune in! Replays of previous shows and projects are also available. Just click “menu” and then “view movies” for a list of previous episodes! Today on Sew Krazy… I taught my viewers how to make an apron skirt! You can watch the replay of it here: http://www.momtv.com/SewKrazyPlayback.html. Catch me every Saturday at 11am EST on MomTV! The skirt I made today doesn’t require a pattern. Just some simple measuring. The instructions are similar to the ones I’m going to post for you. The difference is… I sew on a separate waistband in order to attach my apron. The instructions I’m posting here, are for a simple single seam A-line skirt. It’s a fantastic beginner’s project! Enjoy! It’s Breast Cancer Awareness Month and I’m thrilled to tell you about a fun blog carnival called “How Do You Pink?” I’m sharing my Pink post on Fridays with Cheryl Budge of The Budge Bunch. I participate in an ongoing Skype chat with an amazing group of women. The conversation turned to Breast Cancer Awareness Month and what we could do to bring awareness on our blogs. Many ideas were tossed around and it eventually settled on the cute tag line: How Do You Pink? I Pink by planning… a couple of years ago… I found a lump in my breast. It was very scary… I was 28 and my doctor was calling for an ultrasound, a mamogram, and an MRI. In the end it turns out that it was some sort of fiberous mass that I would have checked out again the next year. So far nothing of any danger has materialized from this lump… but now I plan. I do a monthly breast exam in my home and each year when I visit my gynocologist, we also spend extra time checking my breasts. 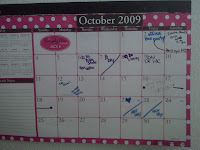 Take a cue from my pink calendar and start doing some pink planning of your own! Make sure you go and check out all of these wonderful ladies and see how they PINK!